The Clemens family at teatime, 1909. A long, long time ago, around the turn of the last century, Missouri-born writer Mark Twain got to be buddies with Thomas Edison, the inventor of, among many other things, the light bulb, the phonograph and the motion-picture camera. It proved to be a pretty good friendship, not just for Edison and Twain, but for Posterity. It's believed that Edison recorded Twain's voice on one of his wax cylinders. Sadly for us, if he did, it didn't survive. But the results of Edison's noodling around with his movie camera proved more durable. 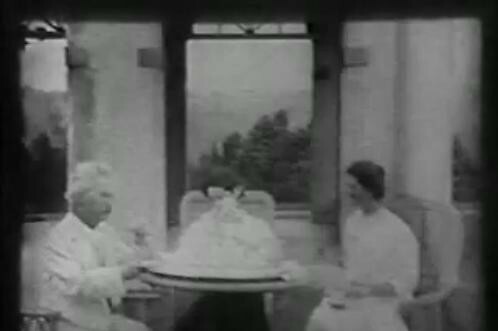 Check out this footage of Twain and his daughters Clara and Jean, shot in 1909 at their home in Redding, Connecticut. Twain walks (apparently taking direction from Edison)! He talks (though we can't hear it)! He drinks tea! He smokes a cigar! Now just imagine what he and Edison had to say to each other once the camera was put away.